Oregon SOS values several ideas about public education. Two that are very important are honoring parent voice and supporting neighborhood schools. We are also supportive of social justice issues. All these issues have convened at Dyett High School in Chicago where parents and community members have been holding a hunger strike to demonstrate the fact that their voices are being ignored and the neighborhood school is being set up for takeover by corporate interests. We at Oregon SOS support the Dyett 12 who are protesting and standing up for their schools. Here is our official statement with links for more information about this issue. "Oregon Save Our Schools supports the Dyett 12, who are now entering their second week of a hunger strike to save their local school in Chicago’s Bronzeville neighborhood. It is the last neighborhood high school in this community. Bronzeville, on Chicago’s South Side, was historically a major destination for African-Americans who moved north during The Great Migration. The neighborhood has been home to many illustrious African-Americans, such as Ida B. Wells and Louis Armstrong. The school is named for Walter Dyett, an Black music teacher who worked for Chicago Public Schools for 30 years between the 1930s and 1960s and whose students included, among others, Nat King Cole and Bo Diddley. The Dyett community has banded together and worked with education experts over a period of four years to develop a proposal for keeping Dyett open as Dyett Global Leadership and Green Technology School. Mayor Rahm Emanuel and CPS appointed school board seem more disposed to privatizing the school or selling off the property for development. The community feels that the mayor and CPS board have been unresponsive to their needs and requests for dialogue. Like many schools in low income communities and communities of color, Dyett has been systematically underfunded and neglected in favor of privatization schemes under the guise of “school choice”. It appears that “choice” is something only the well-to-do are afforded by advocates of corporate reform like Rahm Emanuel. 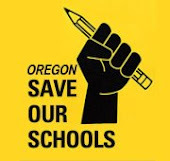 Oregon Save Our Schools believes in local control of neighborhood schools and social justice. Communities of color, like Bronzeville, have been disproportionately affected by school closures, privatization and gentrification in cities around the country. We believe this is wrong. We stand with the Dyett 12. "